One thing that I want to do in the new house is plant a garden. 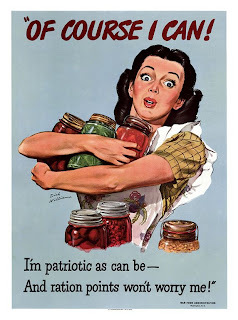 I doubt if I will get into the canning part but you never know. One thing that I have discovered though was how much better fresh organic vegetables are then the ones you buy at your local supermarket. Hence the garden. Now as far as the logistics of this garden...well I have dogs. Ones that like to eat veggies. Yeah I have strange dogs. So I will have to do raised beds. They are a good idea anyways as my body just isn't as young as it used to be. So yeah raised is the way to go. A friend of mine has picked up some huge wooden boxes that she was going to use to plant a garden at her apartment building. Needless to say, the management freaked. So she asked me if I wanted them. Heck yes! They are only good for about a year at which time they will fall apart. But they make for a great start for my garden next year. All I have to do is get some cinder block to go around the outside to make it all permanent. So the mind is working...now just to get them to my house. I have a SUV so let's just toss them on top. I enlisted the help of a friend and off we went. The first issue that we had is that my GPS decided not to work. No problem. My friend kinda knows Federal Way. Well we couldn't find her complex. Had to call her and I still got lost. Once we find the place, the real problems arise. Not only do I have so sense of direction. I also have no sense of size, proportion, distance. Call it what you will but my SUV was too small. We manage to get one of the boxes on the roof rack and head off for home. Took us an hour and her house is only 15 miles from mine. The box tried to fall off once we reached Tacoma and we weren't able to get back on right so I had to drive real slow and my help worked on preventing it from catching air and sliding off. Well we got it there. And it will work. However we will wait until we have the U-haul to get the other one. I guess that it all in the life of a gardener.